This Microwave Bowl Potholder pattern shows you how to make a potholder that actually goes into the microwave with the bowl. It sits in there and twirls, and when it’s all done, you can keep your hands safe by grabbing hold of the potholder, not the bowl! The corners point out just a bit and are perfect to get a grip on. You can complete this project in an hour, so whip up one of these handy, microwaveable potholders and never burn yourself on a microwaveable dish again! Check out even more sewing project ideas in our list of half yard sewing project ideas. I accidently used poly thread on the bobbin for a potato baking sack. It caught fire in the microwave. Maybe 30 seconds won't burn, but 10 minutes will! So sorry GrandmaSue10 I hate that happened. Someone from a previous said to use cotton thread. This is good to know before sewing it so it will not catch on fire. And thanks for suggesting to hold bowl by botto., Is it not sturdy enough to hold by the ears? 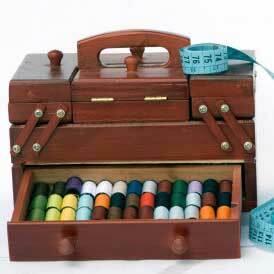 What would you change if you could sew it all over again besides the thread? My friend made a similar one of these for Christmas! Her pattern used darts in the four corners which made the holder curve around the bowl. I have started to use mine everyday, not just for bowls, but smaller plates as well as it is very practical! I am curious about the thread as mentioned by Harriet below, I have made heating pads with Guttermann polyester all purpose thread and have had no problems with the thread melting in the microwave for years, so not sure on that! Thanks for sharing! Once you get ahold of the bowl, put your hand under it. Don't carry it to the table by the 'ears'. I've recently learned to make these using a little simpler pattern. I was so glad to find this kind of potholder that you can put right into the microwave, holding your dish, so no burned fingers! I've given a few as gifts and the recipients seem to really like them!